–Moniteau defeated AC Valley 62-50. Ethan McDeavitt led the Warriors with 24 points. –AC Valley defeated Cranberry 30-17. –Wilmington defeated Karns City 46-41. Emma Johns led the Gremlins with 15. 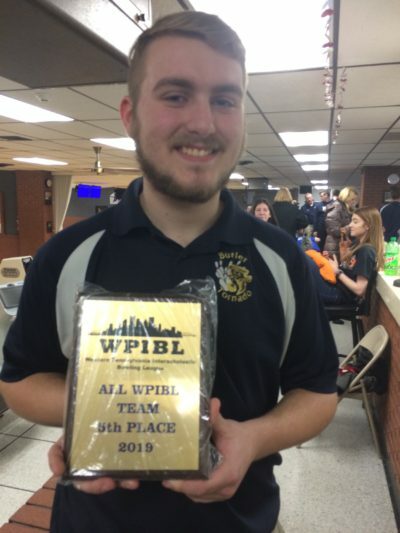 –The Butler Boys Bowling team finished seventh out of 18 teams at the WPIBL Championships Wednesday at Nesbit Lanes. Senior Jordan Reges rolled a 608 series with a high game of 225 to make the All-Tournament team. He was one of only five bowlers to break the 600 mark. Freshman Brock Hepler added a 511 series. Franklin Regional defeated North Allegheny in the championship roll-off to defend their title. The Butler Girls look to defend the WPIBL championship Thursday at Noble Manor Lanes. –Butler defeated Bethel Park 54-27. –Knoch split their meet with North Catholic. The Knoch Boys won 94-53. The North Catholic Girls won 107-74.